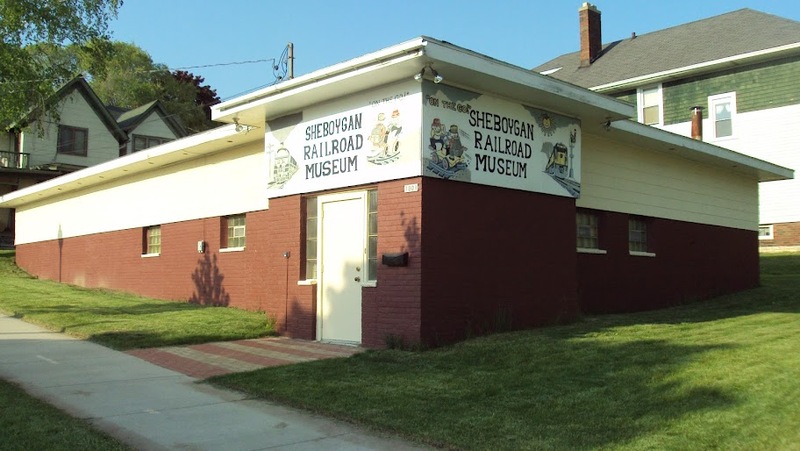 The Sheboygan Society of Scale Model Railroad Engineers was organized in 1977 as a round robin group to share ideas about railroading and to educate newcomers to the hobby. Its goal from the beginning was to be historical in nature, with emphasis on educating the youth on the history and tradition of railroads. We had always hoped to eventually have a permanent home to act as a combination historical museum and hands-on display. The group met in member's homes for a number of years in round-robin fashion. In order to provide the organization with more funding possibilities, it was decided to incorporate as a non-profit historical society. A Constitution and By-Laws were then drawn up and the group was registered with the State and Federal governments as a Non-Profit Corporation. During that time, we decided to build a modular layout with each member contributing one or more modules. Material was purchased in bulk to save cost and 46 module frames were constructed. Individual members then took the modules and finished them so that they could be put together in a variety of configurations. Some are in groups of 3 and 4 modules that have to go together, but others are just single modules. Once the modules were in an operational state if not fully finished, we started to take the layout to various venues wherever we could. 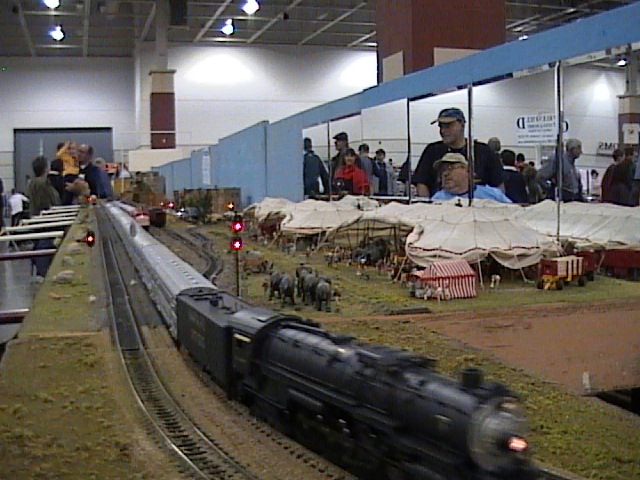 The modular layout still gets set up at least four times a year. Classic Warbonnet, 2 FP45's and a custom built GP60B on our modular layout. It uses three mainlines with a number of sidings and yards. Train meet at the Circus modules. It features more than 500 hand painted figures, a 3 ring Big Top, a side show, a parade down Main Street USA, all the wagons and other equipment, and a complete circus train. This always gets setup whenever we travel with the portable layout and is a fan favorite. In the late 1980's, a local shopping mall had a vacant store which was offered to the group rent-free. This provided a space for the modular layout to be set up in its entirety and a regular meeting place for the members. It also provided a much-needed exposure to the young group, which had only 12 members. The layout, when fully assembled in its standard configuration, measured 34 X 38ft in an "E" shape with a 12 track yard coming out of the middle. This utilized 8 corners and provided a striking visual effect. The only catch was if the store was leased to someone else, we would have to move out. As it turned out, the group was able to stay there for several years. At the same time we were given notice to move out of the mall, a suitable building became available for purchase. The group had now grown to 18 members and the decision was made to commit to a permanent home. Since the sellers were very motivated, the terms were what we decided we could handle, and in November 1993 we had our home. The building needed a lot of work before we could make use of it, as it had been a Lodge for a local group for the past 50 years. 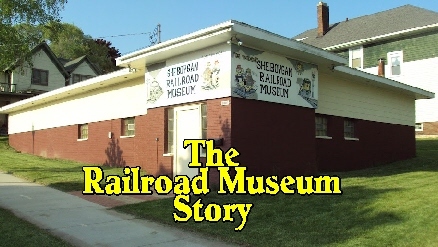 Thus the Railroad Lodge was born, which then became the Sheboygan Railroad Museum. After 6 months of extensive remodeling of the interior including changing walls, changing the ductwork from the furnace, painting, & rewiring, the interior of the building was ready to be utilized. A new roof was also put on the building. A combination meeting room and library was finished with bookshelves on three walls. These were very quickly filled with books, magazines, and videos on railroading, along with a variety of railroad artifacts that had been donated. A dispatch center now occupies a portion of that room. In addition, display cases were obtained to house antiques, brass models, and the craftsmanship of some of the members. The kitchen was gutted except for the sink and turned into a much-needed workroom. Work began on a permanent layout in February of 1994. Photos and text on this site are © 1977 - 2019 Sheboygan Society Of Scale Model Railroad Engineers, Ltd. All rights reserved.